The lament of a mournful harmonica whistles phantomly through the air. The wind blows, and a single tumbleweed rolls across the dry, arid land. These are the badlands, the sertão nordestino, home of the notorious cangaceiros. Defenders of the poor, bane of the rich, these nomadic outlaws will live forever in the dance of xaxado. Xaxado is a lively folk dance associated with baião that originated in Pernambuco, Brazil (specifically in the regions of Pajeú and Moxotó), in the 1920s. Popularized by Luiz Gonzaga of forró fame and other northeastern Brazilian musicians, this dance comes to us from the adventures and exploits of the northeastern bandits known as cangaceiros (from the word cangaço, meaning banditry). With brash and energetic movements, xaxado enthuses with their “work hard, play hard” spirit and evokes life in the hard northeastern countryside. One of the most famous cangaceiros and celebrated figures in Brazilian legend and history was Lampião, once called the “King of Cangaço”. 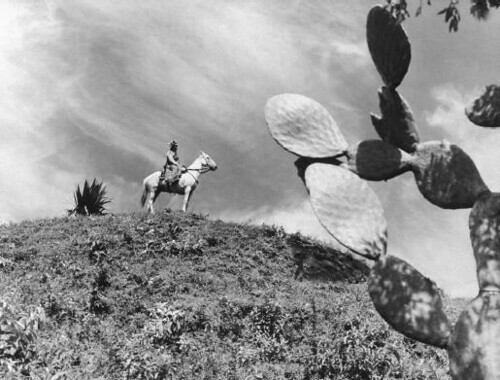 Despite recent research stating otherwise, many believe that Lampião was specifically the person who created xaxado. Whether or not this is true, it is thanks to Lampião and his gang that xaxado spread throughout the lands, and its strong association with the northeastern cangaceiros and their exploits (such ambushing police “macacos”) remains to this day. How did xaxado get its name? There are two main explanations. The first is rooted in onomatopoeia—more specifically, in the sha-sha sound of dancers’ dragging sandals or boots as they go through the dance. The second explanation attributes xaxado’s name to an old sertão war song or war cry, “Parraxaxá“. Originally, xaxado was danced to no instruments. Dancers sung to provide music, and rhythm was marked by the sounds of sandals dragging through earth and rifle butts hitting the ground. Then, xaxado was danced to the same instrumental trio as was originally used in forró: accordion (sanfona), triangle (triângulo), and zabumba (bass drum). Today, one can see xaxado performed with as many instruments as the original three plus bongos, flutes, and maracas. As for the songs themselves, they consist of lyrics with satire and aggression, reminiscent of how the cangaceiros must have viewed and treated life. 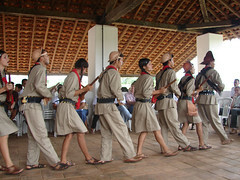 Xaxado is usually danced in a line, a result of Native Brazilian influence, as opposed to more circular forms found in dances such as maculelê. 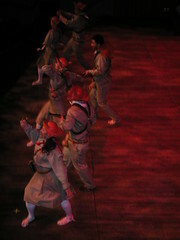 Most modern-day xaxado performances are choreographed, and involve both women and men, although only men used to do the dance when it was first developed. Lampião I knew, but I never heard of this dance. It’s a fun one, too! Hey Balanca! Yeah it is fun, and the music is upbeat and catchy, too.